Plans for a new, modern pedestrian bridge adjacent to the historic Salmon Weir Bridge are progressing well with over €7 million already on the table for the project. Plans for a new pedestrian bridge crossing the river at the Cathedral are intended to be submitted with An Bord Pleanála by the end of this year. The Salmon Weir Bridge is over 200 years old and creates a serious hazard for the vast number of pedestrians crossing it daily because of how narrow the paths are. Its narrowness also makes it a source of serious traffic congestion during the day. The plans for the bridge were presented to Galway city council this week with a preliminary timeframe for its construction. This has been something that has long been identified as a necessary project for improving how pedestrians and cyclists move through the city centre. The bridge will connect the city’s commercial centre side from Newtownsmith over to the other side of the city home to the university, library, and major tourism hub. 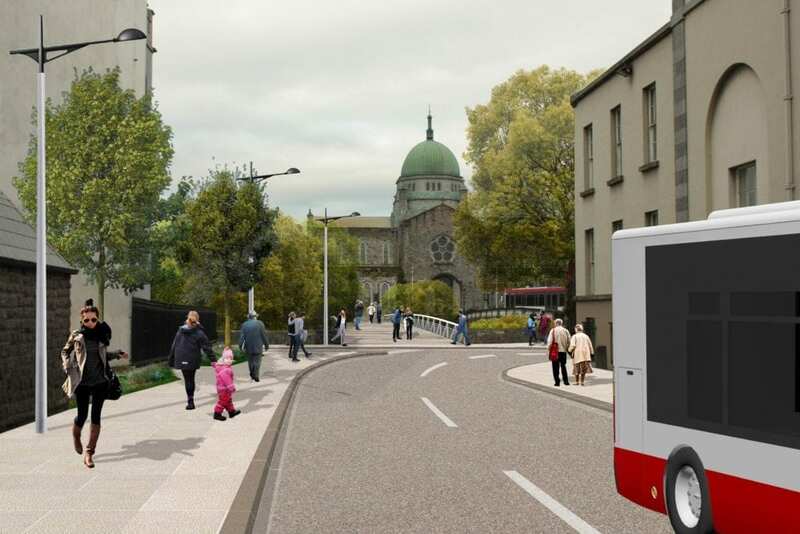 The project is currently in its design stage and is expected to cost in the region of €10 million all told, including work that needs to be done to accommodate the pedestrian bridge on either side. Crucial to advancing this project has been €3.5 million from the European Regional Development Fund which was redirected to this project. The money was originally meant for the creation of a new Galway Library and Cultural Centre on the Headford Road. But Galway city council said that it would not be able to advance this project within the required EU timeframe to make use of the grant. After consultations with the Northern and Western Regional Assembly it was decided the money would go in total to the Salmon Weir pedestrian bridge. The National Transport Authority has also agreed to provide matching funding of a further €3.68 million for the project. Senior Engineer with the city council Uinsinn Finn said that its hoped that construction on the new pedestrian bridge will begin before the end of 2020, with a view towards opening in 2022.